Dispatch forms to staff and contractors. 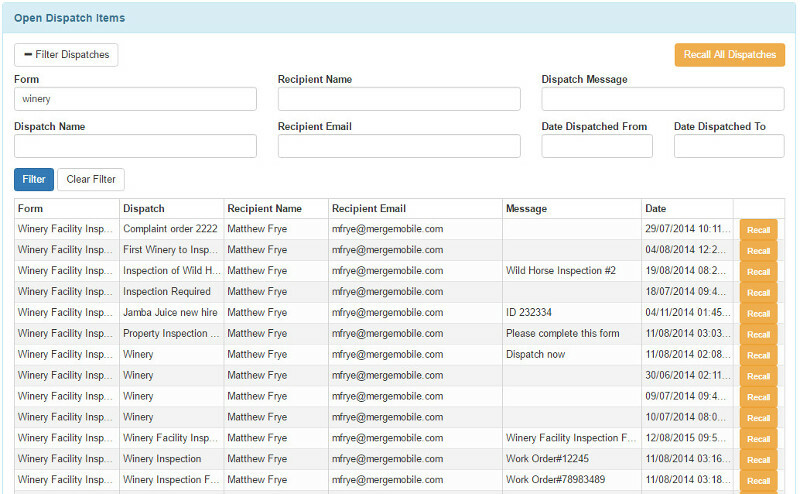 Dispatch forms individually online, through API, or in batch upload. Dispatched forms are tracked to determine when they have been downloaded to the device, when they have been started and when they have been completed. Manage due dates and assignments using the dispatch manager. Recall work from devices due to illness, extended time commitments on prior jobs and other intervening circumstances. Track past-due orders and notify staff and contractors of forms that need to be completed. Safety Inspections, Vehicle Inspections, Building Inspections, Home Inspections, Electrical Maintenance, Site Inspections, Mining Inspections, Oil & gas Inspections, work orders, construction forms, and many business forms of all types.